Home The NewsMill New Delhi only wants Kashmir, not its people: Mehbooba Mufti. New Delhi only wants Kashmir, not its people: Mehbooba Mufti. 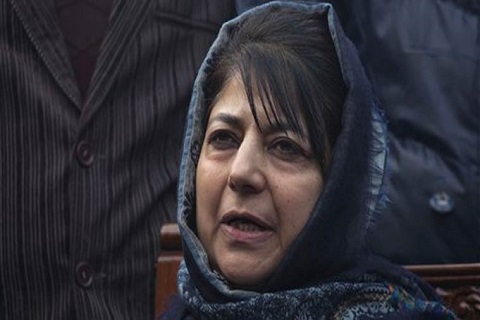 Former chief minister Mehbooba Mufti on Thursday lashed out at the Centre, saying that the New Delhi only wants the land of Kashmir and not its people. “GoI’s current approach towards Kashmir has been consistent only when it comes to repression. Suffocate Kashmiris, throw them in jails, deprive them of basic rights & make them suffer. They only want Kashmir. Don’t give two hoots about what happens to its people (sic),”she said. Peoples Democratic Party (PDP) president’s remarks came in the backdrop of the closing down of the Kashmir highway for two days a week. Previous articleTroop movement: Outrage in Kashmir over highway closure. Next articleClosing highway will have disastrous consequences on Kashmir economy: KCCI.